Adding a bird bath to your yard is the easiest way to provide drinking and bathing water for birds, insects, amphibians, and other wildlife; but the construction of a larger water resource can be far more fulfilling. That said, constructing a watercourse or pond can be quite involved. On the other hand, building a small pond can be pretty straightforward and completed with a minimum of materials. If you are interested in something on this scale, there are many fine books on the subject in the landscaping area of your local home-improvement or book store. Any small backyard pond should be constructed with a few key considerations. Especially here in Iowa and other northern states, always build a system that can easily be drained at the end of the season for clean-out, repair, and to prevent critical components from being damaged by ice. Liners can be commercially purchased or scrounged from a variety of sources; so too pumps and filters. Books, the Internet and extension publications can provide a wild array of ideas on container-based and in-ground ponds. It is up to you to consider what best works within your budget and is most compatible with your landscaping within the space allotted. Be sure to check any local restriction regarding “water hazards” in yards. In general, if the water resource is deep enough for fish, it is deep enough to require a perimeter fence to keep out wandering toddlers. A waterfall or fountain is a great addition to any water feature. They feed the senses and are a great way to provide extra aeration for fish and other aquatic life. Since they almost always involve pumps, one must factor in a pre-filter unit to prevent clogging the pump; and how to power the system. Many small systems are readily available for the hobbyist, but large installations may take a considerable investment and it is not a bad idea to consult a professional landscape designer and electrician. There are various considerations when creating or improving a pond or watercourse; especially larger projects. These may include evaluating the site and obtaining approval and construction permits, constructing a dam, preparing the substrate, deciding on aeration and drainage systems, deciding on how to power the aeration system, choosing liner materials and how to layer them, designing spillways and “dry hydrants” (for emergency water removal), adding plants or fish habitat and landscaping the surround. Finally, there is caring for and maintaining the resource and its flora and fauna. In all cases, there are many available private services and state and federal resources to help. The Internet and your local bookstore have volumes of resources and ideas for planning and constructing your project. In general, when creating a new water resource, the size and depth tend to be dictated by the intended uses of the project. A pond for recreational fishing should be no smaller than 1 surface acre, because small ponds are more difficult to manage and more prone to environmental instability. Large ponds usually are more cost effective to construct and offer better and more sustainable fishing. This type of project should have a minimum depth of at least eight feet in at least 25 percent of the pond basin. Even deeper water (depths of 10- to 12-feet) help to ensure against severe-winter freeze-out situations. That said, it is widely accepted that depths over 12 feet create no additional benefits to fish and are a waste of resources. If an existing pond must be renovated, Daryl Fisher, Area Biologist, Kansas Department of Wildlife, Parks, and Tourism notes in his publication Pond Renovation: Considering Fish and Wildlife, that an unexpected benefit of drought or the accidental draining of a pond, is the resulting need and opportunity to renovate and deepen it, benefiting wildlife or livestock with a much improved water resource. Over time, a farm pond can collect a lot of silt, reducing its depth and water holding capacity. In his web article, Fisher notes that if you plan to renovate a farm pond, you need to be certain that the pond is not deepened so much that it exposes a soil layer (sand, gravel, or shale) that allows water to seep out, and strongly suggests consulting with NRCS staff who can perform a soil probe soil probe prior to renovation work to ascertain underlying soil layers and their water-holding capabilities. No matter what size water feature you construct or are renovating, while it is still dry be sure to really consider where and how you will incorporate plants and underwater-structure features. These may include anchored wood-lattice or brush fish shelters, “reef” and shelf areas for fish feeding and emergent vegetation, creating smaller cat-tail laden “pre-filter” areas to clean up run-off water and shallow water areas for waterfowl hunting, or laying in aeration lines or water lines that can run to a stock tank. Around large ponds consider fencing to reduce or eliminate livestock access to the shoreline will improve the water quality in the pond. Livestock exclusion prevents shoreline degradation, and provides a clean water source. Running a water pipe form your pond to a stock tank allows you to water livestock, as well as preserve a healthy pond ecosystem. Water quality can be impacted by the available nutrient entering the pond through run-off water. For this reason, it is nice to build-in a “pre-filter” catchment where cattails and other vegetation can reduce nutrients in the runoff stream before they enter the primary water resource. 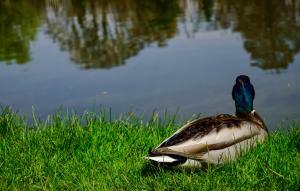 Most pond vegetation helps to clean the water and provides valuable habitat for aquatic species. Algae, however, love excess nutrients and can result in densities that are visually unappealing and harmful to the aquatic ecosystem. There are various chemical treatment available, but recently research has been looking into how the use of barley straw as a common alternative to control excessive algal growth. Barley straw does not kill existing algae, but inhibits algal growth. If you see a problem this year, perhaps you will need to chemically treat, and plan for a barley straw preventative next spring. If you love birds and providing a water feature for them is your primary goal, dealing with predators can be a conundrum. Water resources and bird feeders attract birds and rodents and they attract predators. Predators come in two basic styles: winged and four-legged; but then, in some parts of the country they also slither. The best defense against the winged ones, especially the accipiter hawks who love to hunt songbirds, are brush piles, conifer trees, evergreen shrubs and similar cover; conversely this same cover is the perfect hunting environment for a mink or domestic cat. One solution is to design a “predator-exclusion” cover feature. This can simple be a brush pile or living-shrub feature perimeter ring of old chain-link or sheep fence. Small birds can easily come and go, but predators are stopped in their tracks. An excluder built around a cluster of evergreen arborvitaes or cedars once covered with snow also becomes a very protected winter roost area. Many of America’s amphibians are endangered, you can help them out with a backyard water resource that is accessible and provides some protection from sun, heat and predators. Frogs and toads find safety and lay their eggs in temporary pools or shallow riparian (streamside) habitats. Some natural aquatic or semi-aquatic vegetation helps provide covering shelter, substrate for egg attachment and protection from egg predators, and the invertebrates upon which amphibians feed. To learn about current programs available to assist with livestock watering and other opportunities to address natural resource concerns, please contact your local NRCS office or conservation district office located at your local county U.S. Department of Agriculture Service Center (listed in the telephone book under United States Government or on the internet at offices.usda.gov). Build a Backyard Pond and Waterfall - Spend More Time Enjoying It and Less Time Maintaining It. How to Create a Backyard Pond - from This Old House. Pond renovation: Considering Fish and Wildlife USDA-NRCS and the Kansas Department of Wildlife, Parks, and Tourism. Pond Management Handbook: A Guide to Managing Ponds and Attracting Wildlife - Ohio Department of Natural Resources, Division of Wildlife.